VESSEL TO NATIONAL DEVELOPMENT: INDIGENOUS OR FOREIGN LANGUAGE? At first glance, it would appear that when we speak of Nigeria’s ascension to greatness, language is nothing but a rickety ladder if not a fiery meteorite which is constantly drawing us back. However, is this truly the case? Can our dialectical diversity or linguistic import ever be a viable tool in our quest for national development? If yes, which is the way? Many have, with good cause, criticised Nigeria’s adoption of an exoglossic language. They say it has caused a massive erosion and corrosion of our culture. They even say it is one of the instruments of neo-colonialism. But then have we ever paused to consider that this may in fact be a blessing in disguise? 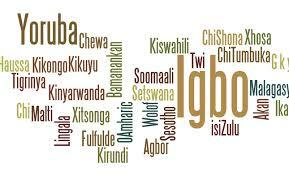 Statistics tell us that of the 7106 known languages of the world, as many as 527 are present in this tiny country called Nigeria. This much heterogeneity in the fundamental medium of communication may no doubt be likened to the Sword of Damocles as far as the unity and progress of the country is concerned. Put differently, there is no way a community can develop if the commonalty cannot communicate in unity. A unifying language is indispensable especially in a country like Nigeria where there exists deep-seated inter-ethnic antipathy. In school, for instance, I cannot imagine what the experience would be like if I could not converse with my friends easily regardless of their tribe. A friend of mine even once remarked that there is nothing stopping him from marrying a lady from the North if not that he fears she may not be able to converse freely with his family. Thanks to our English lingua franca, his fear is trimmed down to a considerable extent. Above is however just one end to the rope. In spite of it, I still believe we must be wary. We must be wary of the prevailing and potential dangers inherent in exalting the Whiteman’s language when it is not that we have none of our own or that ours are in anyway inferior. We must be careful lest we end up as strangers in our own land and illiterates of our own tongue. For me, Nigeria can develop at the same pace and even faster without the sanctification of the English language. And one of the reasons this is so is that the English language has constantly constituted a glass ceiling to the youth’s educational advancement. You cannot further your studies to the university level unless you pass English language, a feat many do not find easy. The West African Examinations Council said in August, for instance, that only a meagre 39% of candidates who sat their examination obtained credits in five subjects including English and Mathematics while in 2012, 57% of the students actually failed English language. If this course is made voluntary and is substituted with familiar indigenous languages, it will prevent the dashing of hopes and quashing of dreams merely because of lack of English proficiency. An understanding and promotion of our indigenous languages can also help to strengthen the amity between us as a people. It will lessen feelings of hatred and distrust. Nelson Mandela clearly understood this when he remarked that if you talk to a man in a language he understands, that goes to his head. If you talk to him in his language, that goes to his heart. Thus, if students are encouraged to learn the three major languages in Nigeria during their basic education phase, then we will not have to grapple with situations wherein a Hausa man would think a Yòrùbá man is calling him a thief (bàràwó) when he is actually saying báwo (how are you?). We have even heard of one who murdered his friend because he called him aboki, a word meaning ‘friend’ in Hausa but which Yòrùbás take to mean ‘a dullard’. Furthermore, indigenous languages can also assist in the preservation of our culture. Marcus Garvey said; a people without the knowledge of their past history, origin and culture is like a tree without roots; but I feel obliged to add that without roots, it is unthinkable for a tree to germinate or develop. Sadly, we presently live in a generation where mothers tongue-lash their children for speaking in their mother tongue, where pupils are fined for speaking in fine vernacular and where the youth rely on Android applications to get native proverbs. Also, we live at a time when of our 527 languages, 7 are extinct, 27 are in trouble and 43 are dying. All this must change for there can be no national development or even tourist investment if there is no unique national embodiment. I would say that rather than wait to see how the language of our former slave masters will miraculously help us to become more developed than them, why not preserve and propagate our made-in-Nigeria dialects so that they may equally become foreign languages to other lands? Our fathers often say that no matter how long a log stays in water, it can never become a crocodile. Would it not then be wise for the log to ditch impractical fantasies while it works towards betterment?